Getting rid of dog odor in a yard can be done with minimal work or cost if you do not want to do the work yourself. The more dogs you have, though, the more often you need to clean the yard. Dog feces that is allowed to “hang around” eventually causes a foul odor in the backyard, making entertaining unpleasant. Once you smell the dog odor in the backyard, it might hang around a few days, even after pickup, but once you get on a schedule with cleanup, simple cleanup methods will keep the yard smelling fresh. Pick up all dog feces in the yard using the shovel and rake or a pooper scooper. Discard the feces in a plastic trash bag, and dispose of the bag in the trash receptacle. Rake the entire yard to ensure you did not miss any small bits of feces. Discard the raked waste in plastic trash bags, and dispose of the bag in the trash receptacle. Rinse the entire yard down with the sprinkler. If you have a sprinkler system, run the sprinklers for two hours. 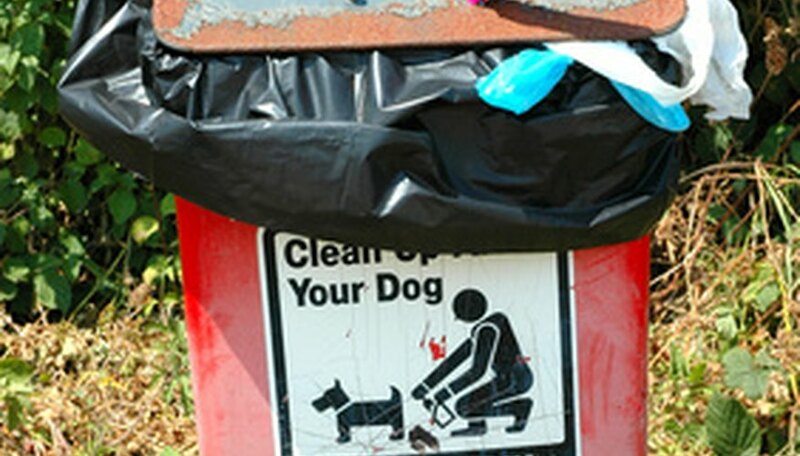 Make a reminder for yourself to pick up the dog feces at least every other day. If you wait, the smell starts getting into the ground. Run the sprinklers at least once a week for no less than two hours. If you live in an area with watering restrictions, run the sprinklers or hose the yard down on your watering day. If you do not want to or cannot pick up the feces every other day, hire a teenager to clean the yard. Some areas also have professional "pooper scooper" companies that will clean the yard for you. Watering once a week ensures not only rinsing small pieces of feces and urine into the soil, but ensures you have a healthy lawn. If the lawn is healthy, the grasses and soil absorb the odor. If you have more than two dogs, clean the yard every day to ensure no odor buildup. Once you clear the yard of odor the first time, you will not have to spend the time raking it except for once in the spring or fall.